Marriage is truly a lifelong adventure, so why not start yours with an adventure wedding, immersed in a private tropical paradise? 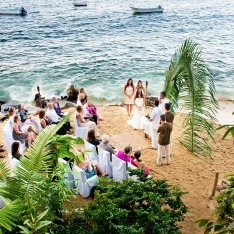 Our exclusive tropical beach hideaway, Las Caletas, offers wedding parties, large and small the ideal location for the adventure wedding of your dreams. With the majestic Sierra Madre Mountains as your ultimate tropical backdrop, the seclusion, and breath taking natural beauty, Las Caletas is the perfect location for an unforgettable celebration. Accessible only by boat, there’s truly no place more secluded or romantic. From quaint and casual to over the top sophistication, we’ll design an unforgettable, personalized experience to suite your individual style and budget that’s guaranteed to launch you into matrimonial bliss. Our professional wedding coordinators will handle every detail of your big day with an all inclusive package so you can relax, knowing that all is taken care of. And because all of our facilities and excursions are owned and operated by us, we’re able to coordinate and book all of the wedding party's events, tours and activities for you too. Modern Bride magazine ranks Mexico as the fifth most popular destination for weddings in paradise, and once you experience Las Caletas, you’ll know why. You have contacted Vallarta Adventures!